You can place widgets inside a grid. A grid can contain groups, where each group has one or more widgets. A PyQt5 window can contain a grid. groups can contain widgets (buttons, texts, images). A grid can be created with the class QGridLayout. As you’d expect, the grid layout has to be added to the window. 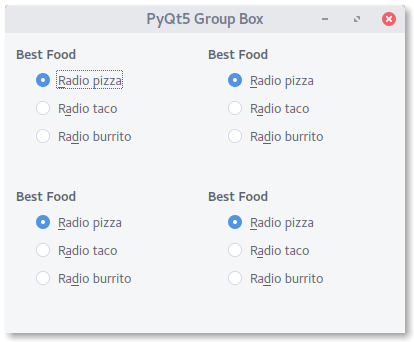 A groupbox is created with the class QGroupBox. The code below creates a 2x2 groupbox in a window. We create a groupbox using QGridLayout. This in turn can have widgets. Widgets are added using the method addWidget(widget, x,y).